Carpet cleaning, Upholstery cleaning, Rug cleaning, Mattress cleaning, Car cleaning and Stain removal. North Shore, Auckland, Orewa, Whangaparo­a. Monday- Friday and Saturday by appointmen­t. Closed Sundays. Are You Moving House? 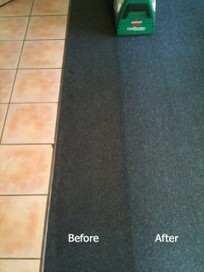 Or Have Your Carpets Looking New Again In 90 Min. We will do the vacuuming for you because an effective vacuum gets out a lot of extra dirt than just washing alone. When we arrive in your home we'll start with a thorough pre-vacuum. Our powerful upright vacuums remove all the deep down, fine dirt and dust. Its become normal to remove around a shopping bag full from most houses! If your house is furnished, leave it to our strong men to move the furniture. Making it easy for you is our priority. Want the carpets to be dry again quickly? The Big Green machines are fantastic with their very fast drying time. Carpets are usually dry between 1-4 hours. Our shampoo formulas are all DfE approved, meaning they are designed for the environment and safe for children and pets. Have a look through some of the before and after photos to see what an amazing job our technicians have done for others and what they'll be able to do for you! We'd love to help you make your carpet cleaning simple and easy. Please call us today for a quote. Bronwyn: HI Helen We are so delighted that you are happy with the job that was done. Cameron: Thank you very much for the positive feedback. We are delighted that we were able to assist you and that you were satisfied with our service. Cameron: Hi Neil Thank you for your review. We are so glad that you are happy with your carpet clean. I would NOT use this company again... the manager steam-cleaned carpets in our house several weeks ago and in one room the carpet is still noticeably wet in places and now smelling mouldy. It's hard to understand how it could stay wet so long (we've checked there are definitely no leaks) but they adamantly refuse to even look at the carpet, saying they 'know for a fact' that it's not their responsibility- a very poor mean-minded service attitude, and not one likely to get them far in business. Cameron: Thank you for your feedback John. Sadly you omitted the true facts. I did your carpets on the 4th March and now 3 months later you complain that they have still not dried. Our dry time is 3-5 hours maximum so 3 months is definitely not related to anything we did. You also mentioned that your current tenants whom you have just evicted never opened any doors and windows resulting in a smell that was strong and stale. To claim that your carpets are still wet 3 months later is simply preposterous. These guys did a fantastic job! They were prompt, extremely friendly and helpful. Will certainly use them again and recommend to everyone I know....thank you!! Lovely to deal with. Very Efficient and did a great job. Very professional job, would highly recommend this Company to everyone! Tracy at Life Clinic Health & Beauty, North Shore. Absolutely recommended - fast, efficient and they do a GREAT job. Will definitely use them again, it is a pleasure dealing with a company/people like this. I had two stains, one of which professional stain removers refused even to try to remove. Removed by these carpet cleaners, and I had no complaints from landlord. Trustworthy and reliable. Left them on their own - they locked up after they were done. Great effort - carpets are clean and smell fresh. Highly recommended. Awesome job yet again. Outstanding service and result! Thank you. Excellent job highly recommended, easy to communicate with and awesome price! Will def use again. Excellent work. He really did a wonderful job of my mats. One was very dirty and it looks like new. Lovely person too great sense of humour. Excellent service, arrived on time - did a fantastic job of the carpet - unobtrusive and very professional. Would highly recommend and definitely would use again. Keep it up guys! Awesome job, thorough and friendly. Looks great! Hoping the stains don't come back as they did after another company cleaned them. Very happy so far, would definitely use again and highly recommend. Highly Recommend. These guys did a great job cleaning our Smart Strand carpet. Julia was efficient in the booking and quoting process. Matt was on time, cheerful and did the job in the amount of time specified with another person. They moved furniture, vacuumed and then cleaned. The carpet looks great and smells good too! I cannot recommend these guys highly enough. Matthew did a great job, and despite having to work late into the evening, was friendly, helpful and cheerful all the way through. Our carpets look and smell great. Thank you.